Claude and Toni Cipriani arriving at the laundromat. 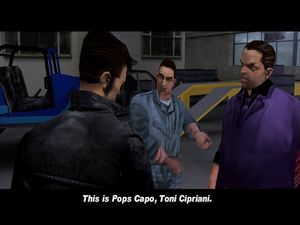 Cipriani's Chauffeur is a mission in Grand Theft Auto III given to protagonist Claude by Joey Leone from his garage in Trenton, Portland, Liberty City. Claude stops by Joey's Garage looking for more work, and Joey introduces him to Toni Cipriani, the caporegime of the Leone Family, who's car Joey is fixing. Joey tells Claude to drive Toni back home and to come back later for more work. However, Toni asks Claude to instead drive to Chinatown to collect unpaid protection money from Mr. Wong's Laundrette. Claude drives Toni to the laundrette with Toni entering and quickly exiting the laundrette as two Triads begin to shoot towards him. Toni gets back into his car and Claude drives him to his home in Saint Mark's, where Toni tells Claude to come back for more work. Joey Leone: Yeah, I know Toni, I've tuned her real sweet. She purrs, you know what I mean? Oh! Here's the guy I was telling you about! Alright Listen. This guy ain't Italian and he's no mechanic but he can get things fixed. This is Pops Capo, Toni Cipriani. Toni Cipriani: Yeah, I'm Toni Cipriani. Joey Leone: Take him to Momma's restaurant at St Marks, alright. Now listen to me, I'm planning a job that needs a good driver so drop by sometime later Ok? Toni Cipriani: OK, Kid. Drive me to the laundry in Chinatown first, I got a bit of business to take care of. Those washer women aint been payin' their protection money. And watch the car, Joey just fixed this junk heap. So no fancy crap, OK? Toni Cipriani: Hey watch the car! I said no fancy crap. Toni Cipriani: Wait here! Keep the engine running. This ain't a social call. Toni Cipriani: It's a Triad ambush! Get us out of here kid! Toni Cipriani: The Triads think they can mess with me, the triads, with ME! Drop by later and we'll give them something to launder, their own blood stained clothes! The reward for completing the mission is $3,000, with a bonus $2,000 if the players kills the four attacking Triads at the laundromat. Completing the mission unlocks the "Dead Skunk in the Trunk" mission for Joey Leone and "Taking Out the Laundry" for Toni Cipriani. The player is also notified via pager that the Uzi is unlocked for purchase from Ammu-Nation, at a cost of $800. Claude and Toni Cipriani leaving Joey's Garage in Toni's sentinel. Toni Cipriani telling Claude to keep the engine running while he goes inside the laundrette. Toni Cipriani being chase from the laundrette by two Triads. Toni Cipriani and Claude escaping after running over two pursuing Triads. Claude about to park the car at Momma's Restaurante. Toni Cipriani telling Claude to come back later to attack the Triads. This page was last modified on 3 July 2014, at 14:53.